You are no doubt looking for a receding hairline treatment and currently have a hairline similar to the photos above - what we offer is an alternative non surgical solution which gives you a fuller hairline, bringing it forward so that it looks natural with an undetectable hairline. There is no need to have surgery or spend 1000's of pounds. You can acheive a full head of hair with a receding system. Hair loss accurs in a number of different patterns and forms and not all looks the same or is exactly the same shape. 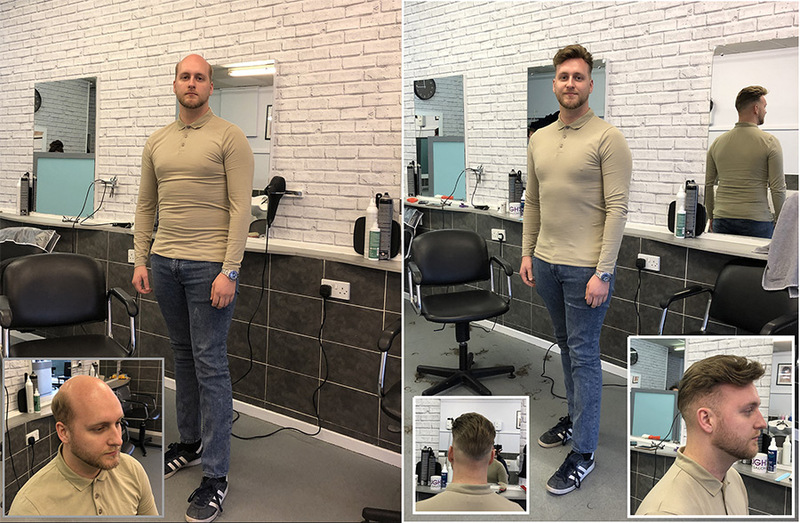 However a receding hairline combined with thinning hair of the crown area is usually the first stages of hair loss and finding a solution at this early stage allows you to get a full head of hair and keep on top of your balding. We are based in Wolverhampton, West Midlands are for over 25 years have been providing hair systems for clients who travel to us from all areas of the UK. We specialise in non surgical hair system as a solution to hair loss - but are also a hair salon and have been established for 35 years - this combined enables us to achieve the final results that are natural and undetectable and the is reason why people travel to us. If you have any questions about our receding hairline treatment then contact us - you can email us using the form below or call us. We offer free consultations in private cubicles so feel free to book an appointment. this solution to my hair loss - thanks!..." Call us today on 01902 246004 to arrange your free consultation in a private cubicle.